Originally published in the February 21, 2012 issue of Shelf Awareness Pro. Reprinted here with permission. Receive Shelf Awareness Pro in your inbox daily by registering here. Though most well-known for her fiction (including the Pulitzer Prize-winning Gilead), Marilynne Robinson is also an accomplished essayist. When I Was a Child I Read Books is her fourth collection of essays, carrying forward themes for which she is consistently recognized: faith, culture, patriotism and self-identity. In exploring these ideas--and her ideals--Robinson leaves no subject untouched, from the role of science in explaining our origins to the practical worship of capitalism in the 21st century, from our treatment of the poor to the intertwined nature of religious identity and American patriotism. With "The Fate of Ideas: Moses," Robinson examines the laws of Moses as presented in the Old Testament, which she calls "a brilliant economics based in religious ethic marked by... an anxious solicitude for the well-being of the needy and the vulnerable." She laments the loss of the spirit of these laws, positing we have come to value property and possession over assisting the impoverished. In the title essay, Robinson uses her own experience as a child reader to parallel our one-time lust for exploration and adventure in the American West. She goes on to reckon with the loss of individualism, or perhaps the loss of the celebration of individualism, and our seeming complacency with the status quo. "Everything, for all purposes, still remains to be done," she presses. We need, in short, a modern version of the American West to spur our imaginations, to motivate us to once again embrace the spirit of the individual. Other essays explore subjects equally important, and some just as mundane, all with a critical, questioning eye that is both impassioned and thought-provoking. 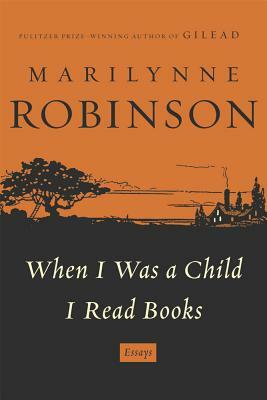 Throughout, Robinson approaches these topics through the lens of her own faith and beliefs, but the lessons ultimately transcend any one religion and instead encompass our very definition of our selves, as individuals, as Americans, as readers, as members of a faith--or not, as the case may be. It is this transcendence that makes When I Was a Child I Read Books as relevant for non-religious readers as for the observant, as important for Jewish readers as Protestants. Robinson's essays are thoughtfully passionate, forceful, clear-eyed and concise. As individual pieces, they inspire a new consideration of particular issues; as a whole, they force readers to reconsider who they are--and, perhaps more importantly, why they are. This sounds like a must read to me.